Dawn's Wedding Feast was on special exhibit. I was awed by it. At first I thought it was just large boxes, but it was gorgeously intricate and delicate. Cordellia shared her own experience of seeing a huge piece entirely of gold some years before at MoMa. Albee, who knew and was friends with Nevelson, is an art collector himself. In the play, he challenges us not only to also know her but to discover whether or not we can know somebody's true personality. Nevelson, an interesting persona, wore brightly colored robes, head scarves and lush layers of sable lashes. An immigrant, she married up into a wealthy Jewish family and moved to New York City. She suffered from depression and was never happy as a wife and mother. She eventually found success in the late 1950s in sculpting room size pieces, made from discarded pieces of wood which she painted in all white, black or gold. It was believed that she made up many stories about her past. Through a sort of master class, Nevelson is interviewed by The Man, played humorously and doggedly by Larry Bryggman. The staging and set was very simple, until a curtain rose at the back of the stage revealing huge pieces of Nevelson works (recreations?) in the white, gold, and black behind a scrim. It took my breath away. 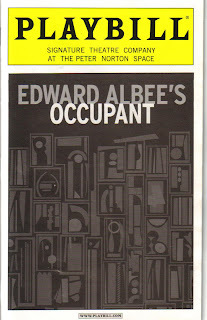 Occupant runs through July 13th and is more than worth seeing for a very intertaining two hours of theatre. I had no idea that this show was about a real sculptor. The things I learn from you. Here's to the Walker exhibit!